My itinerary is exactly what I planned for except for Day 6, which I ended up going to Hulhumale, instead of going to Dhifussi Island from Fulidhoo. As I missed the local ferry to Dhifussi, I figured that it is too risky to go to other island far from Male (No ferry available on Friday) and decided to just stay to explore Villingili island. Lazing around at the beach, enjoying the sound of the waves. 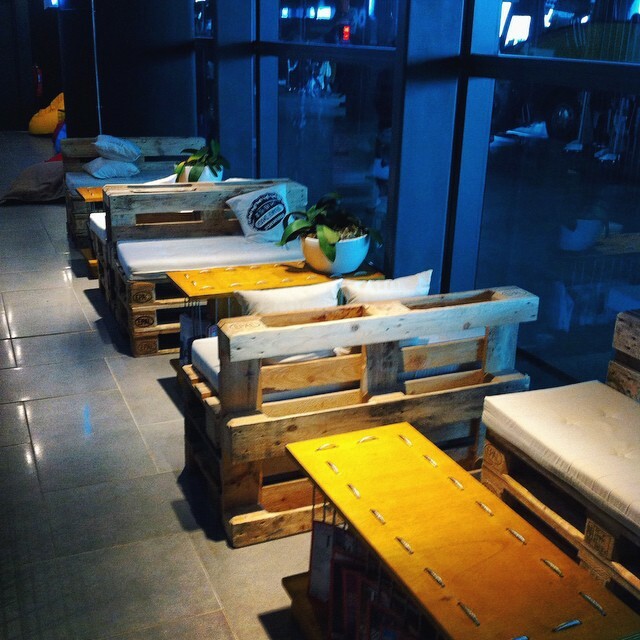 Stay at the airport or go to town? I booked my flight ticket back to Kota Kinabalu (KK) 13 hours apart from my flight from Kathmandu to Kuala Lumpur (KL). 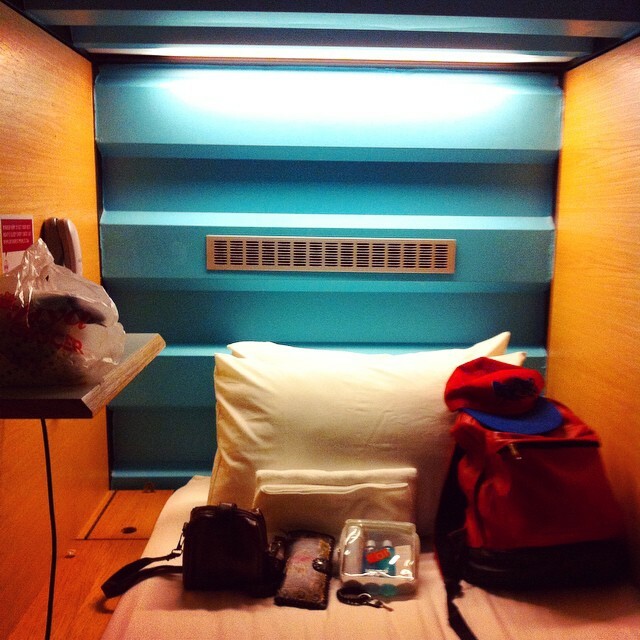 After roaming around the airport, not knowing what to do and so damn sleepy, I decided to try the capsule room suggested by one of my travel buddy. I slept in the first 2 hours and check out 1 and a half hour late. Thank god the reception guy did not charged me anything. Thanks! Few more hours to go. Can’t wait to be back on my own bed! Touch down! We arrived at Kathmandu 4 and a half hours later (7:45pm, Nepal time). The flight was okay but I got the most uncomfortable seat for a girl. I’m surrounded my Nepali’s guys that are so excited to go back to their hometown after staying abroad few months or even few years. I’m not being racist towards the Nepali’s guys but the way they look at me is like hunter waiting for their prey. No matter what I did; reading books, watching movie, sleeping, listening to music and even eating, the stares just won’t go away.. The guy that seat next to me kept on bumping his elbow against mine. Worst ever is that he can’t stop moving! Not sure if he’s too excited to go home or he’s nervous being inside the plane. The plane was so noisy that it sometimes make you forgot that you’re still inside the aircraft. Most of them unbuckle their safety belt as soon as they saw the Kathmandu’s city light from up above. They even pushes people around as if they’re competing of who’s going to be the first one to be at the arrival. The airport worker lead us to an electronic machine and scan our passport to get our details so that we don’t have to fill in the form manually and can directly queue to the arrival visa. Sadly, most of the machine are not working after few times of tries. At the end, we decided to just fill in the form. 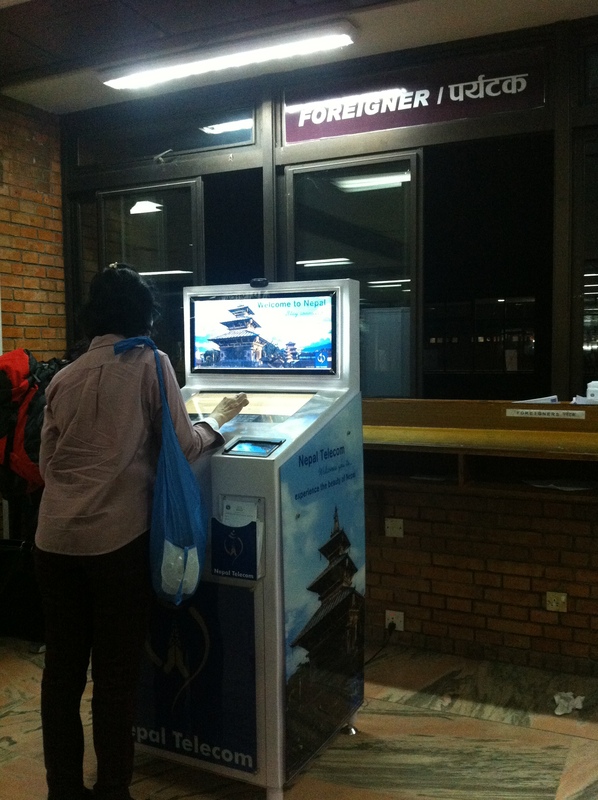 Electronic machine to scan your details from your passport. Most of the machine are not working..
We wasted almost an hour at the airport trying to fill in the arrival form; manually and electronic, queuing to pay for the arrival visa. We paid USD$25 for 15 days visit. MAKE SURE TO BRING YOUR PASSPORT SIZE PHOTO FOR THE ARRIVAL VISA. 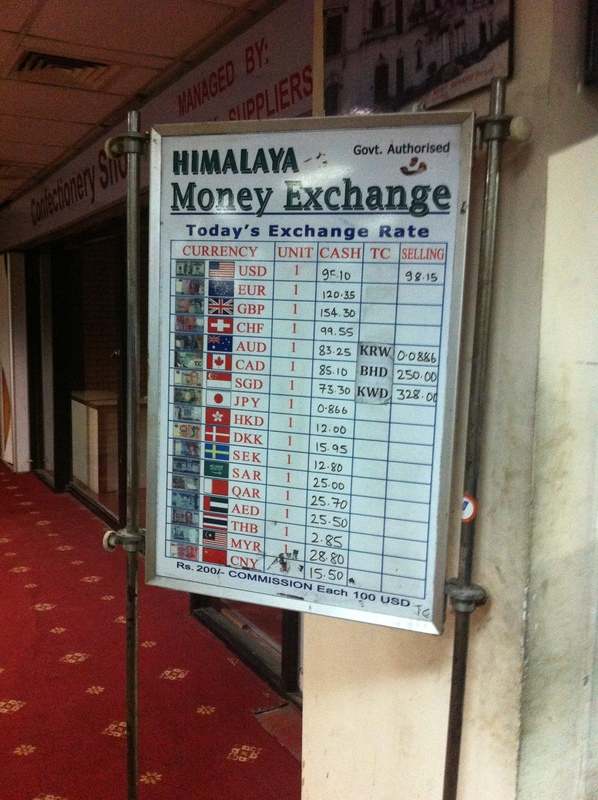 Exchange rate at the airport (arrival) as at 28th Sept. 2014. They charge NPR 280 for every exchange rate made. As soon as we got out from the Tribhuvan International Airport, we were approached by 2 guys that are so friendly and giving us warm welcome. They even offer to carry our bag. But we declined. But when we’re trying put our bag to the car, they grab our bags and help ‘organizing’ it so that we have plenty of space to sit down. At the moment we’re about to leave, they asked us for money. We’re so speechless about what just happened that time. We thought they are part of the travel agent that came to fetch us and helping us was part of their job. Sadly, they’re not. DO NOT LET OTHER PEOPLE CARRY YOUR LUGGAGE WHEN YOU’RE AT THE AIRPORT! It’s a scam. If someone offer you to carry your luggage, just say no. They’ll ask for tips and some of them won’t leave until you give them some money. They usually ask for RM20 (~USD$ 3) if they knew you’re from Malaysia. We arrived at Hotel Silver Home (http://hotelsilverhome.com/) around 10pm. After the check-in registration, the reception guy took us to our room which is at 5th floor. Going up the stairs with our heavy backpack was really tiring. We almost lose our breath as soon as we got to the room. 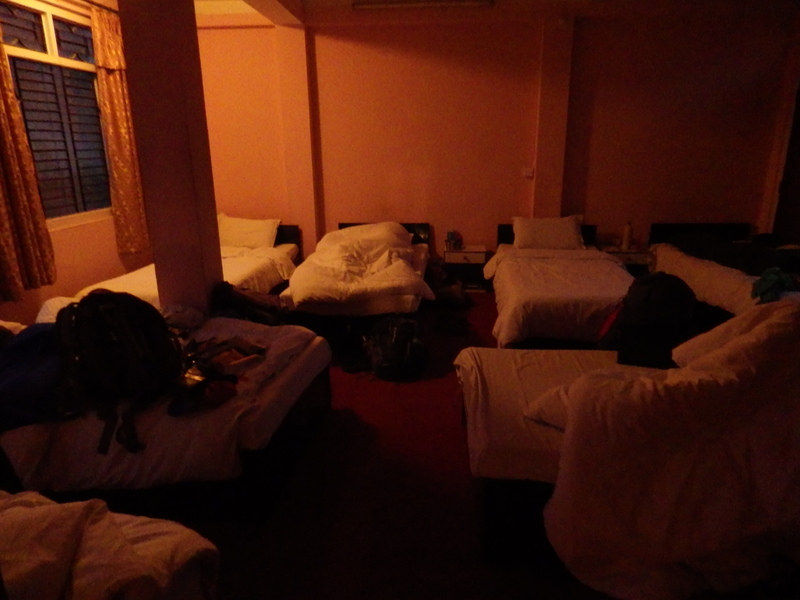 The room was so big and there’s 7 beds. We got hotel for USD$3 via www.AirasiaGo.com. 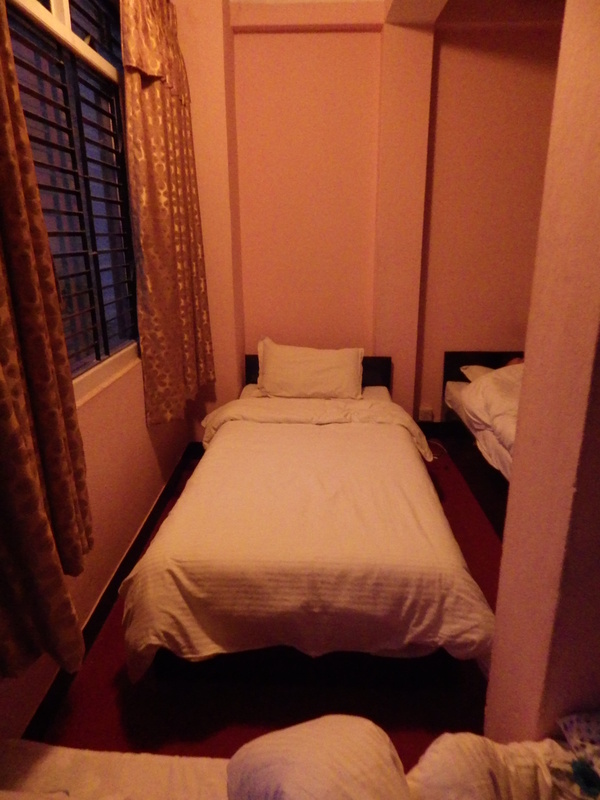 The Hotel Silver Home’ normal price for the Dormitory Room is USD$3.5 per bed. The bed. It’s so comfortable! I slept so well the whole night. Overall view of our dormitory. We were planning to go to Pokhara the next morning by bus but the cs guy that offered to get the bus ticket for us was unreachable that night. Therefore, we decided to just booked with the hotel. Sadly, there’s no more ticket available. The reception guy told us that should have book the ticket bus earlier as it everyone’s going back to their hometown for the festive season (Dashain) going on next week. But he asked us to just go to the tourist bus terminal tomorrow morning as early as 6:30am to try our luck on getting our seats as some people cancelled their booking last minute. We ‘collapased’ right after that.. It was indeed a very tiring day for me carrying my backpack. You are currently browsing the Budget Tour category at Wanderlust Overloaded.